Brisbane born mezzo soprano Victoria Lambourn has been a principal artist with Opera Australia since 2009. She studied at the Royal Northern College of Music, graduating with a Bachelor of Music (Honours), a Postgraduate Diploma in Performance and a Master of Music in Performance. She has won scholarships from the Peter Moores Foundation and the Australian Music Foundation Awards. For Opera Australia Victoria has performed Rosmira in Partenope, Nancy in Albert Herring, Juno in Orpheus in the Underworld, Zweite Dame in Die Zauberflöte, Suzuki in Madama Butterfly (OzOpera), Flora in La Traviata (OzOpera)and understudied Rosina in Il barbiere di Siviglia, Dorabella in Così fan tutte, Woglinde and Grimgerde in Der Ring des Nibelungen, Hermia in A Midsummer Night’s Dream and Niobe in The Love of the Nightingale. 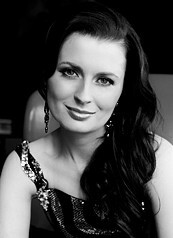 For other companies Victoria has performed Hänsel in Hänsel und Gretel (State Opera of South Australia), Florence in Albert Herring (Victorian Opera), Rosina in Il barbiere di Siviglia, Dorabella in Così fan tutte (Melbourne Opera), the Governess in Pique Dame (Sydney Symphony Orchestra) and La badessa in Suor Angelica (Macau International Music Festival). Last year ABC Classics released an EP album featuring Victoria singing opera arias and the Flower Duet from Lakmé, and this year has seen the release of a CD of Percy Grainger works on the Chandos label which includes Victoria singing with the Melbourne Symphony Orchestra. On 23 November 2013 she received the German-Australian Opera Grant in Melbourne and will depart to Germany in May/June 2014 to become part of the professional ensemble at the Hessisches Staatstheater in Wiesbaden for one year.